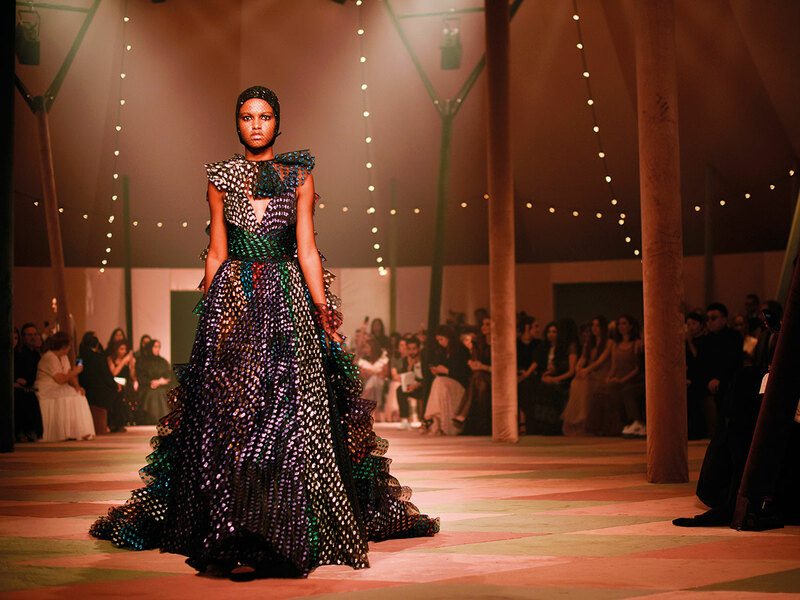 Trust Dior, the iconic French fashion label, to transform a public park in Al Safa in Dubai into a fantastical playground filled with a glittering circus marquee and models wearing shimmery pleated skirts, shiny skull caps and swirling capes as a part of their Middle Eastern debut on March 18. 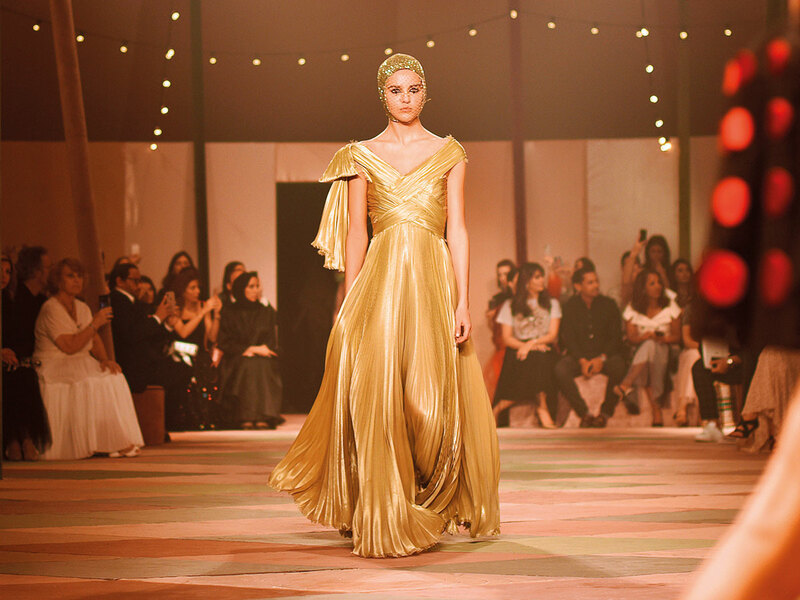 Italian designer Maria Grazia Chiuri, who paraded her flamboyant spring-summer 2019 haute couture collection to the UAE, showed how it’s done with absolute aplomb and transported us to her enchanting magical kingdom. Chiuri, like a seasoned circus ring leader, began by acquainting her well-heeled guests to her superbly-tailored capsule collection that was playful and fun, but never frivolous or clownish. Multi-coloured polka dotted gowns, ringmaster blazers and lion-tamer jackets were a mainstay at this fashion show that exuded a carnival-like atmosphere. Models wore clunky-heeled boots, tattooed stocking, sequined skirts, all as a nod to the acrobats and tamers in a circus. Shorts paired with sheer white shirts with frayed ribbons and leather corsets also made its presence felt. But our absolute favourite was the red, fitted redingotes with hand-embroidered frogging, a nod to the iconic Dior Bar Jacket and structured sleeves. Chiuri also looked to her host country, the UAE, for inspiration as she added a small collection of 15-pieces in addition to her creations that were earlier showcased at Paris Fashion Week earlier in January. “Every time we move to another country, in some ways it’s the location that gives us inspiration … When you think about Dubai, you think of a place that in a sense is very Mediterranean, where there is the sun. So we used more colour, different techniques, different shapes,” said Chiuri in an interview with AFP. Her Middle Eastern debut was also her way of promoting global sisterhood and women empowerment. “The more I go around the world the more I think that the women are the same around the world,” added Chiuri in the same interview with AFP. The all-female models on the runway also symbolised how the female performers in a circus trust each other blindly while performing their stunts underlining the solidarity among them. The carnival atmosphere didn’t end with the glamorous fashion showcase that saw Dubai’s wealthy social set attend. After Chiuri took a bow on the runway as golden confetti swirled around her, the marquee was instantly transformed into a party zone filled with acrobats and clowns on unicycles. The guests, who were mostly dripping in Dior, also got down to making merry late into the night. As far as fashion debuts in the Middle East go, Dior has set an example on how you blend fantasy, fiction and fashion in one go.